The city of London is planning another spectacular New Year’s Eve, something we usually try to celebrate because we can never seem to stay awake for our own celebration in the states. 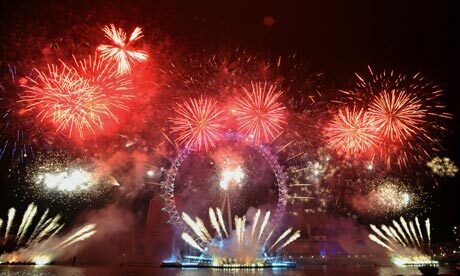 So lift a glass at midnight London time, and Happy New Year to all! 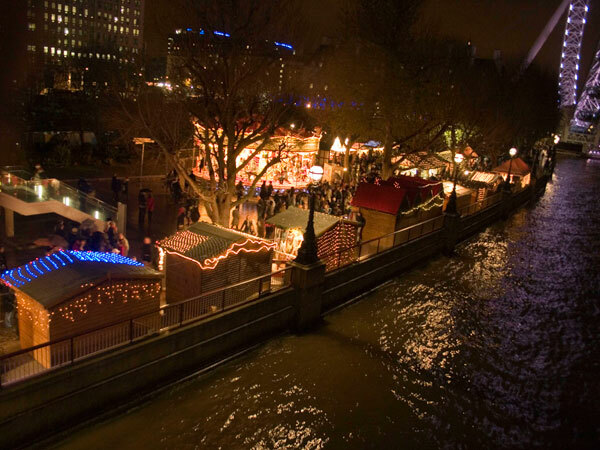 The Mayor’s midnight fireworks display by the Thames attracts huge crowds – usually around 250,000 people. Viewing areas fill up around 2-3 hours in advance! An exclusive live DJ set from Radio 1’s Nihal will keep the crowds entertained pre and post the pyrotechnics, starting at 10pm. You’ll also get to hear the famous Big Ben ‘bongs’ just before the launch of the UK’s biggest annual fireworks display from the London Eye, alongside a tailor-made soundtrack. Allow extra time. Big crowds in central London will make moving difficult. You may have to walk further than usual to reach your destination. 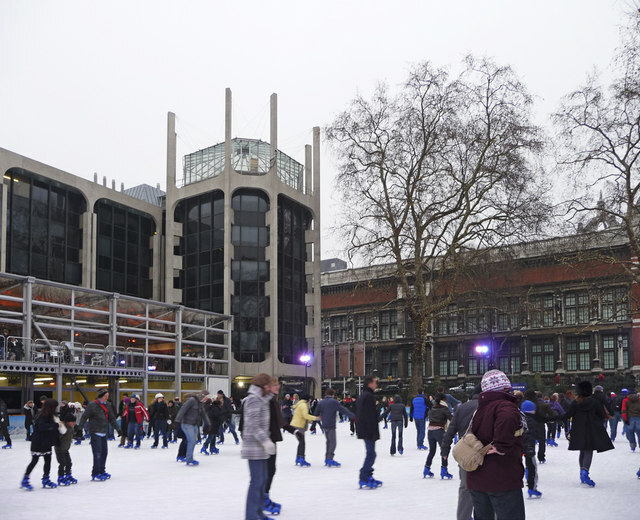 As winter arrives, outdoor ice skating rinks appear in London. They open from mid-November to mid-January and many have special events happening throughout the season. I love the idea that these skating spots pop up throughout the city for the season. There’s advantages to being in a very cold country. 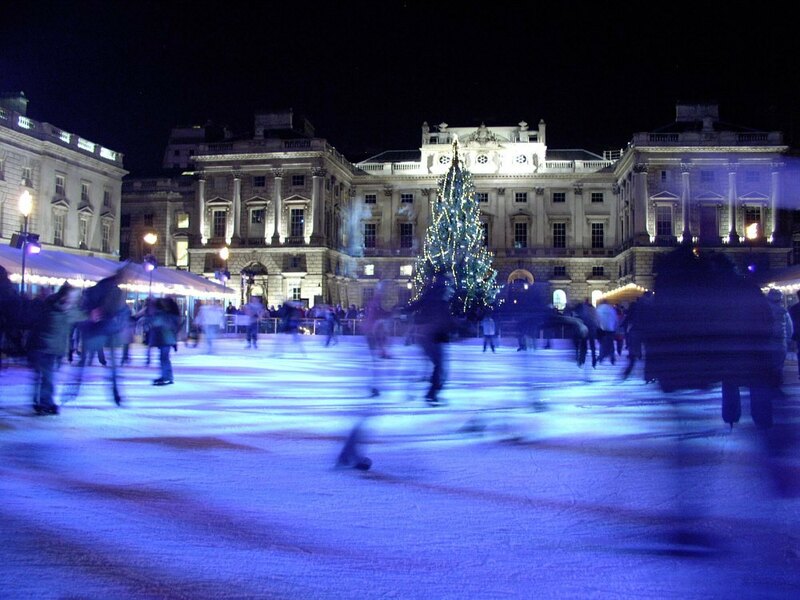 The rink at Somerset House is open until January 22nd this year. They even have a New Year’s Eve party. The one at the Natural History Museum is only open until January 8th. They materialize like magic, some in small corners, some in a space much more grand. The space at the Royal Naval College looks spectacular from past years. I grew up on Long Island in New York, and loved escaping down to the local pond to go ice skating when I was a child. It was always a fight for space on the slick surface between the boys trying to play hockey and the girls practicing their twirls. But when I got older, I had the joy of having an apartment for a decade in New York City. 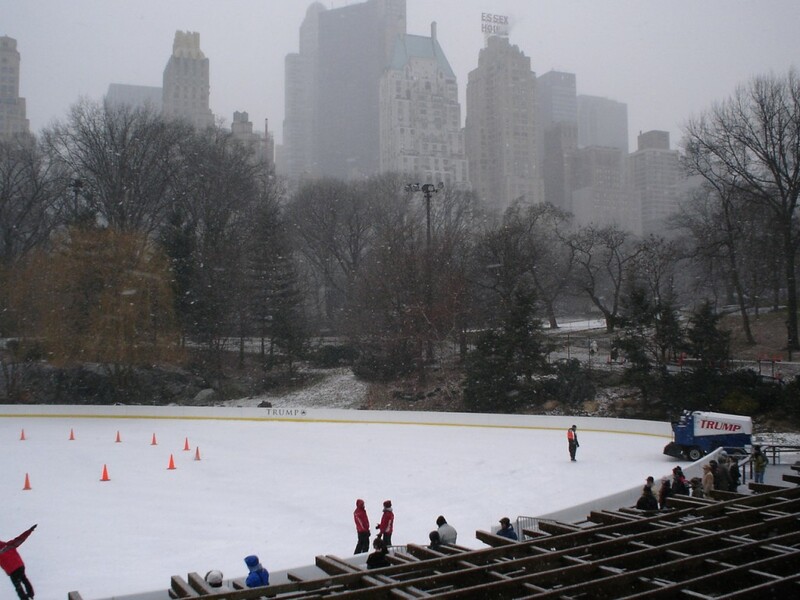 It was a wonderful time of year when my sister and I could head over to Central Park and see the rink being readied for skaters. 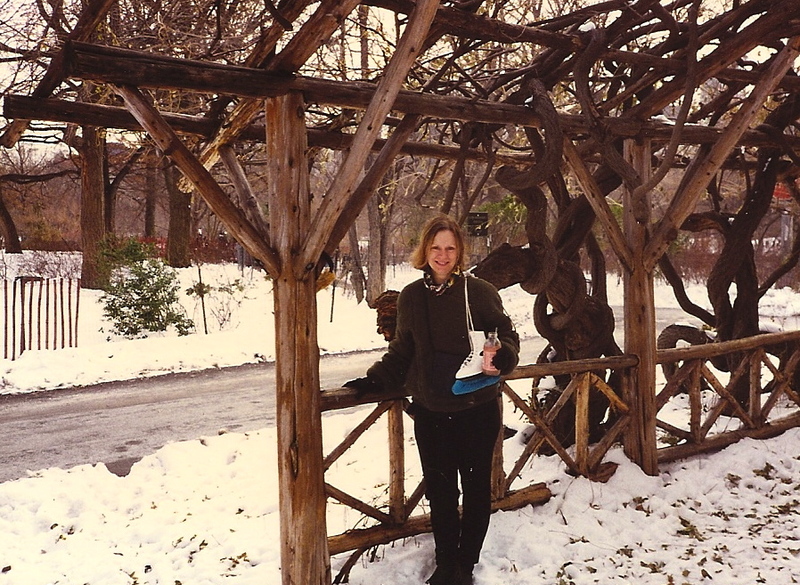 Heading over to skate in Central Park years ago in New York City. Photo by my sister and skating companion. It was a small circle to go round and round in, but fun none the less. And there was hot chocolate to be had at the end of the day. We couldn’t wait to get out there. It was definitely a city rite of winter. 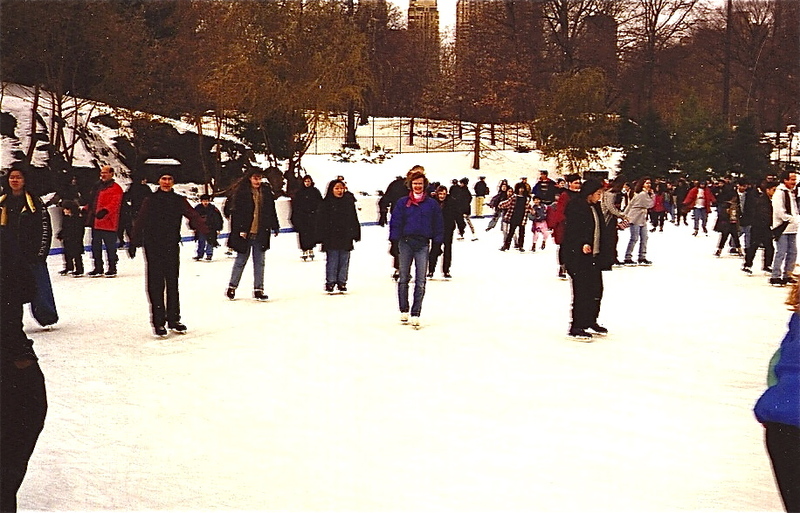 My sister skating in Central Park. Photo by me. 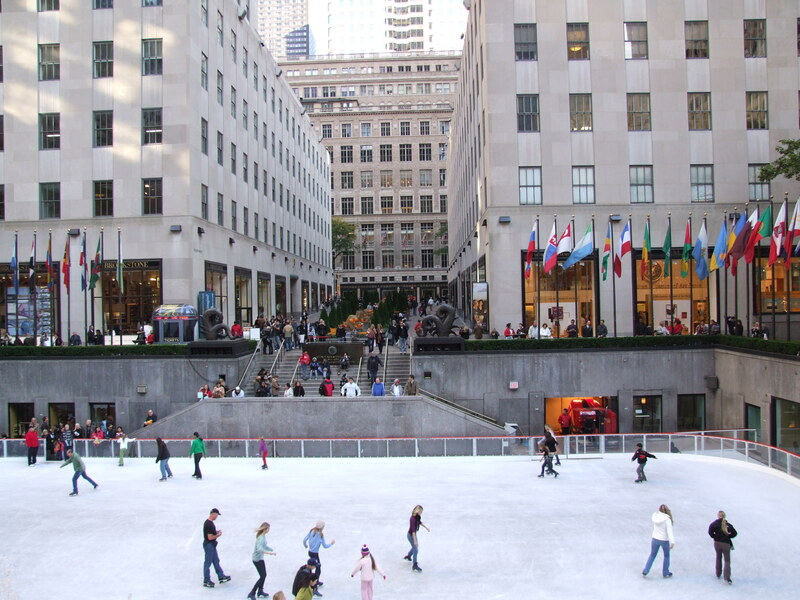 For pure crowd watching nothing was better than the ice skaters at Rockefeller Plaza. I never skated there, but spent hours standing at the elevated railing watching the show below. There was such a variety of people swirling around on the ice. There was one particular man that did almost a slow motion dance on the ice. For years when I returned he would be there, doing his dreamy, Tai Chi like moves on the ice. I wondered if he ever left. Often my sister and I would stand above the rink and watch him do his moves. And then one day we returned and he was not there, and we never saw him again. We often comment on him when we see the rink, and wonder where our mystery skater has disappeared to. 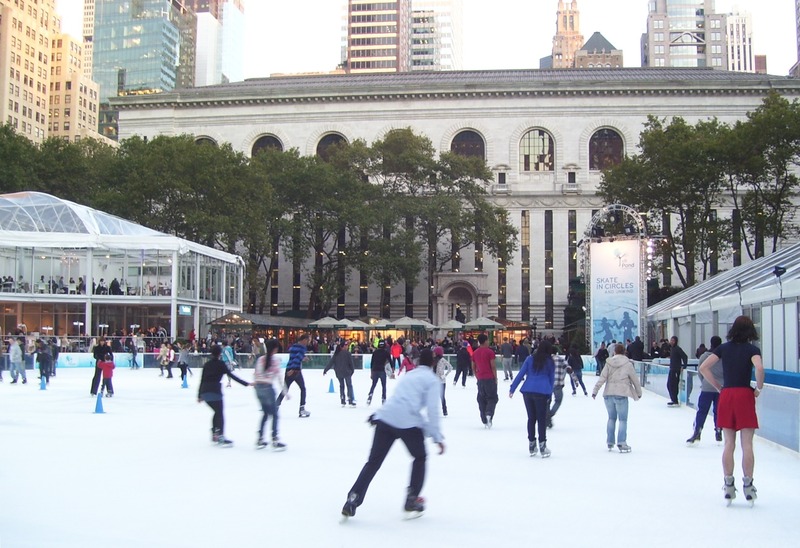 A new favorite rink is the one at Bryant Park behind the NYC Public Library. This one is open well into February this year. One more place to pass the winter season with swirls and twirls, and maybe a few bruises. But the hot chocolate is always available. 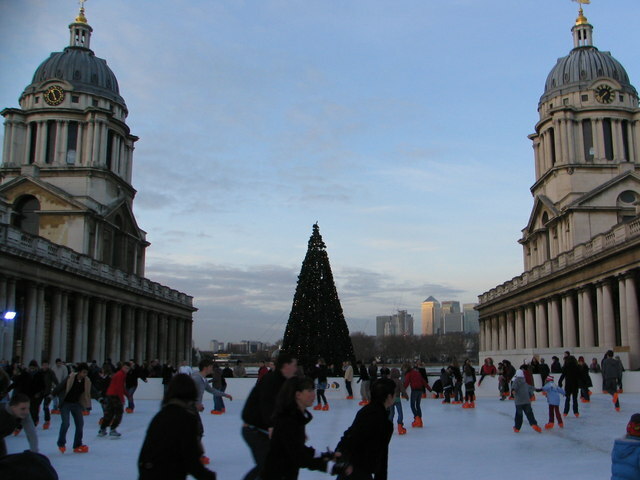 I love that both cities, London and New York, have their own traditions of winter skating that are so similar and yet distinct to the individual city. I’m not sure which is my favorite spot, but I think it must be Central Park because of the memories. I started setting the table yesterday with the help of my sister. I love all the traditions of the Christmas dinner…turkey and stuffing and pumpkin pie. 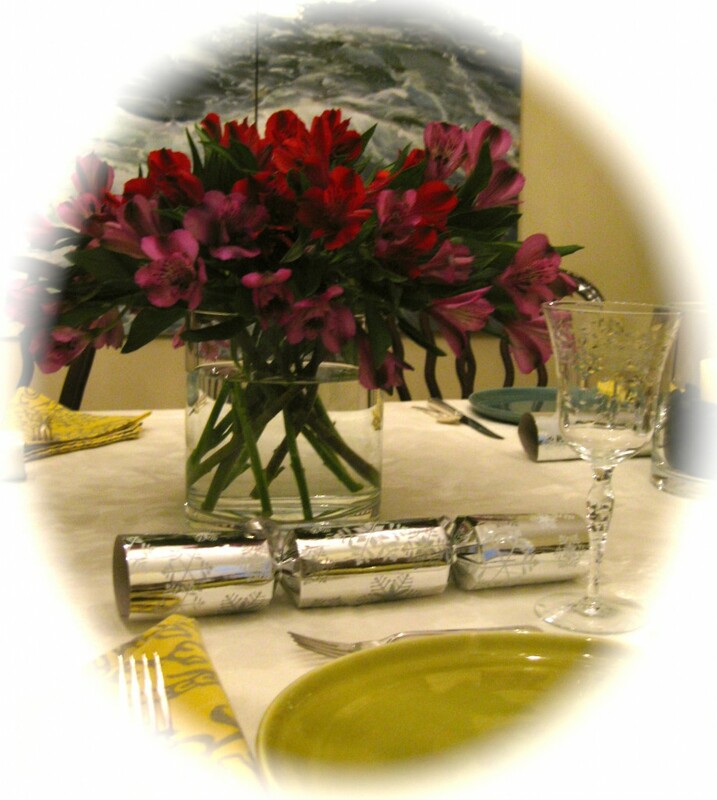 And decorating the table is part of the fun. 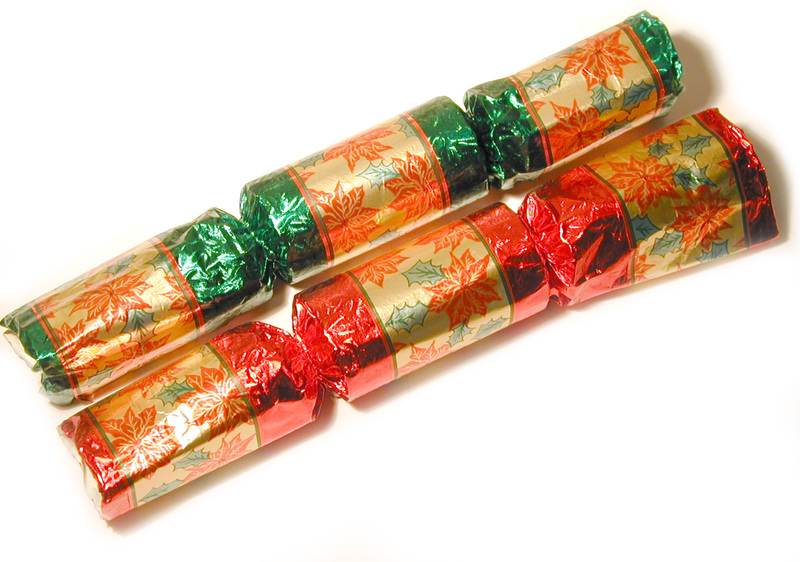 The Christmas Cracker is a tradition that I was introduced to by My Beloved Brit, and I must say when I first heard of them it was difficult to find the pretty little fabrications that give a pop and are filled with funny jokes, small toys and charms and a colored paper hat or crown. I do think they are lovely sitting on the Christmas dinner table, but the paper hats may be a bit much. The cracker is supposed to be pulled before Christmas dinner by two people, similar to a wishbone and one tradition has it that the person who gets the larger piece gets to keep the contents. We like to give each their own cracker and everyone at the table takes turns reading their joke or fortune. Crackers were invented by Thomas J. Smith of London in 1847, a purveyor of bon-bon sweets that he sold wrapped in a twist of paper. Eventually, Smith started to come up with new ideas to increase sales. Initially he started including mottos in with the sweets, but soon he was inspired to put the “crackle” idea in to the treat when he heard the sound from the fire. The size had to be increased to include the snapper mechanism, and eventually the sweet was dropped and the little surprises were added when his son took over the development of the product. 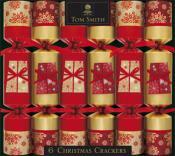 You can actually order Tom Smith’s Christmas Crackers in the US now. The idea of the paper crown may have come from Twelfth Night celebrations, where a king or queen was appointed to oversee the celebration. I read recently that even the royal family has crackers at their Christmas celebration and although I don’t know this to be absolutely true, the article said the only one at the table who didn’t wear the paper crown was the Queen herself. Merry Christmas to all. Let the feasting begin! The Holiday. I love this movie and especially this time of year. It highlights my two favorite fantasy locations–England and LA. England, because, well, you know, it’s just so British, and LA because it is so entirely different and exotic in its own way from the east coast location where I grew up and lived most of my life. ‘The Holiday’ brings together the star talents of Kate Winslet, Cameron Diaz, Jude Law and Jack Black in a charming romantic comedy with an international twist. The plot revolves around two women who swap houses for Christmas with the idea of escaping from their current lives and romantic problems. Much of the English side of the story was shot in the village of Shere in Surrey, a quintessentially English village with antiques shops, tea rooms and several excellent pubs. The other Surrey town of Godalming also stars and is well worth a visit for its fine architecture, independent shops and peaceful riverside setting. 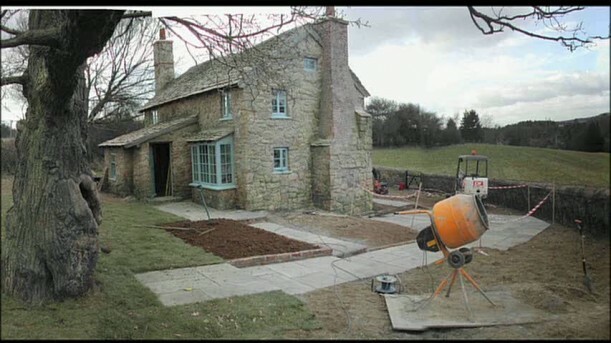 There is a wonderful blog called “Hooked on Houses” that goes into lots of detail about the two houses featured in The Holiday and even has a poll that talks about which of the two her readers prefer. Thank you Julie. It is still a fun read. And here is Amanda’s house set in the movie at a Brentwood section of LA. 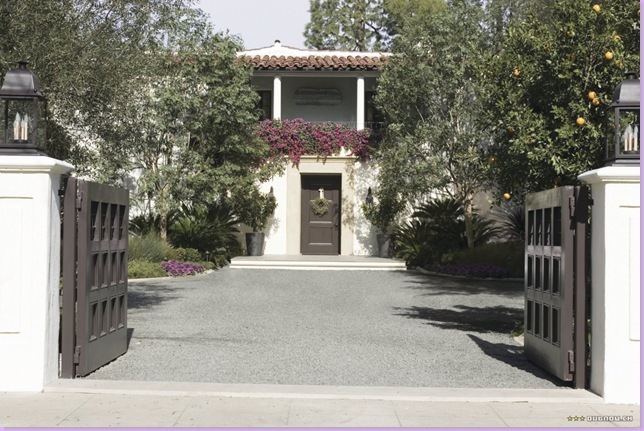 (actually the exterior shots of the house showing the gated property were filmed in front of Southern California architect Wallace Neff‘s Mission Revival house in San Marino, a suburb adjacent to Pasadena. Neff had built the house for his family in 1928.) Other Los Angeles locations included Arthur’s house in Brentwood and Miles’ house, designed by Richard Neutra, which is situated on Neutra Place in L.A.’s Silver Lake area, near downtown. The interiors were all shot at Sony Studio. But I digress. 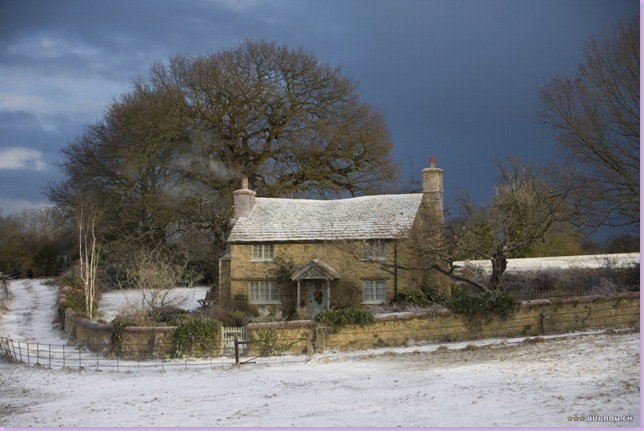 The thing I find so interesting about this movie is how Iris’s house and location reflect such unique characteristics of the English way of life…the narrow roads (which still can scare the wits out of an American driver), the houses that simply don’t have enough heat when it is always cold and damp (not really), the interiors of many of the houses with every square inch covered with some kind of pattern or books or collectables. Then there is the local village and pub that is the center of life. We have yet to visit a village where we did not seek out the best pub to get a read on the true character of the area. The movie is a fun time, if a bit light on the true cultural differences, but it does make the point beautifully that as different as we are, we are really just the same. I could have told you that, but not nearly with such charm. 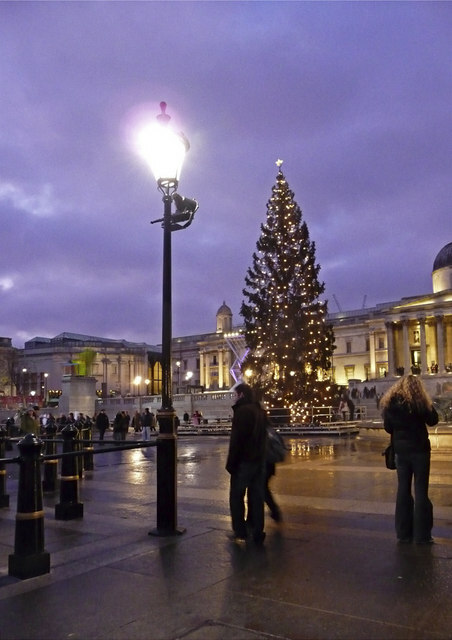 The majestic Trafalgar Square Christmas Tree is a London tradition that attracts hundreds of tourists and spectators each year. The people of Oslo Norway have been giving a Christmas tree to be displayed in London’s Trafalgar Square since 1947 in gratitude and friendship to the British people for their support during World War II. This year the tree was lit on December 1st, and will be lit from noon until midnight every day until the 12th night of Christmas in early January. From Monday December 5th until Thursday December 22, a different choir will be singing around the tree to raise money for various charities. A tree has been given annually since 1947. Isn’t this fabulous. 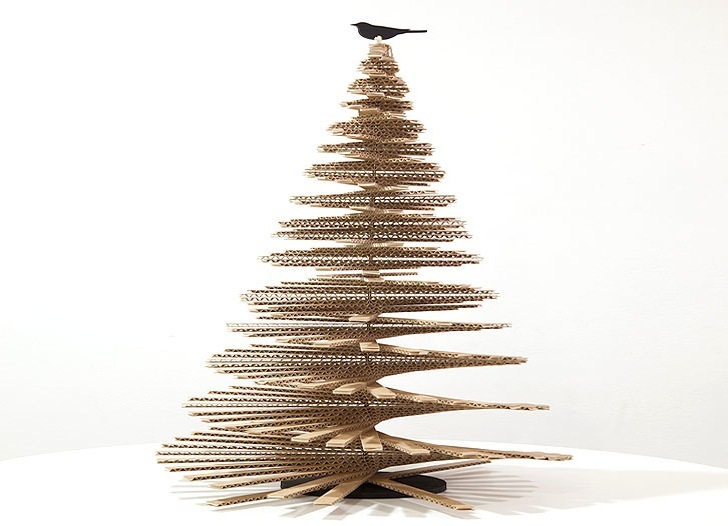 Giles Miller has created the world’s largest cardboard Christmas Tree, standing almost 20 feet high in the Design Museum of London’s public atrium. The tree has at least 3,600 individually cut, handmade cardboard pieces. Recently some friends of ours were telling us about the spectacular Christmas markets that are a tradition in Germany every year. 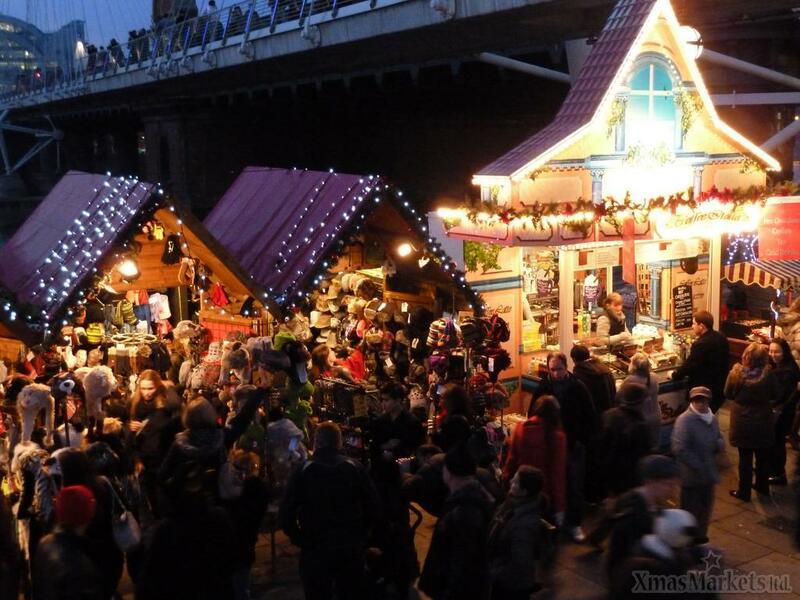 While I was looking at the View London website, I noticed that London has this same type of market beneath the London Eye on the Southbank for the month before Christmas. 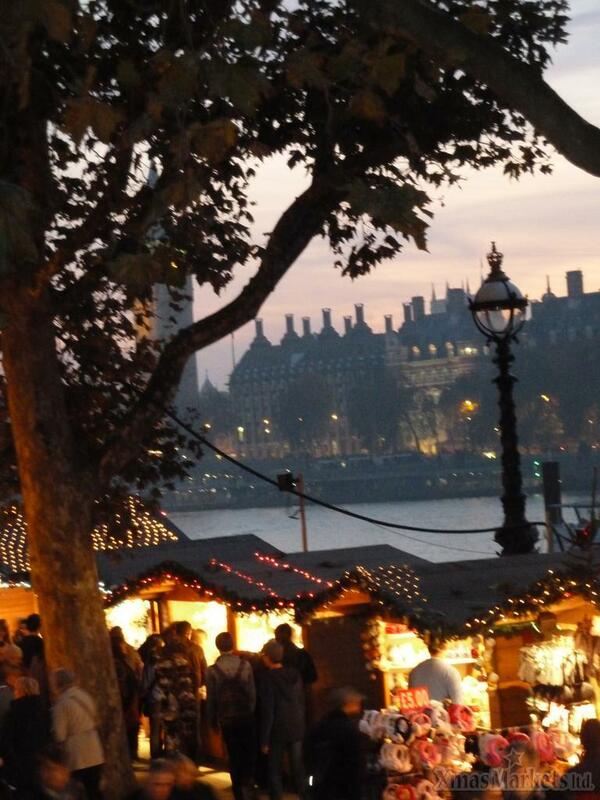 The traditional Christmas Market features 60 open air chalets between the Southbank Centre and the London Eye and offers gifts and culinary specialties (one photo shows Angus Beef for sale. Yum!). 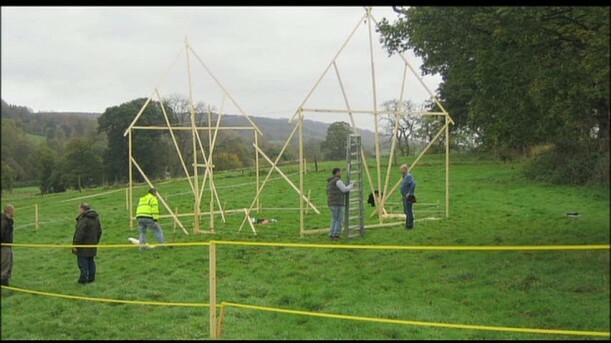 The market will take place this year from November 18th until 6 pm on the 24th of December 2011. In the tradition of the German markets you can even get a glass of “Gluhwein” (German mulled wine) while listening to traditional Christmas music and watching the children go round on the merry-go-round in the center of it all. Happy Holidays! 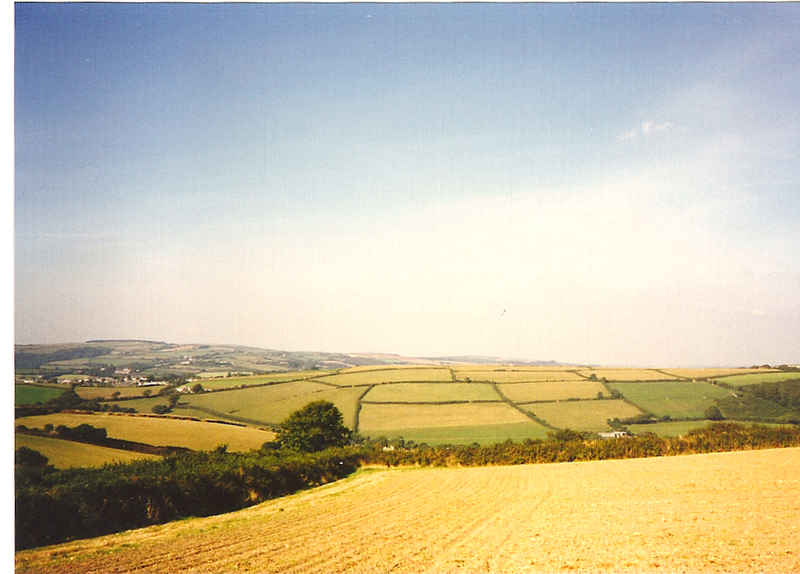 One of the first spots outside of the London area I visited in England with My Beloved Brit after we were first married was Cornwall. His cousin lives there, who is like the brother he never had, and we drove the few hours west from Heathrow to visit. I was groggy from jet lag (MBB had come over early to do some racing so he was my chauffeur), but I do remember the drive and the beautiful quilted hills. That was my name for those multicolored fields that were criss-crossed with hedgerows and pressed by endless sky. It was home to MBB, and even when I woke up enough to register my astonishment that we had just driven past Stonehenge, he was rather unimpressed. To him, it was just a familiar distance marker on the many trips he had made in his life from London to Cornwall. 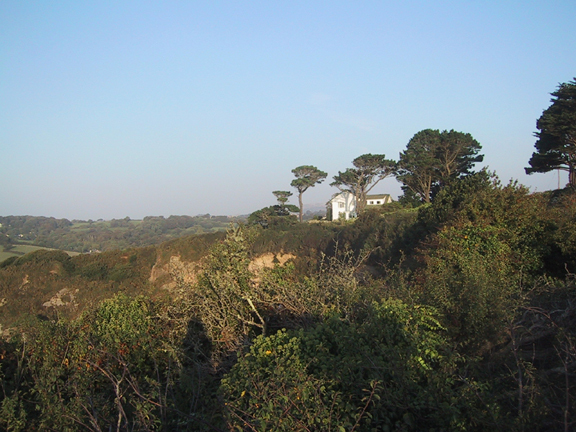 We ended up in an area near St. Austell called Carlyon Bay where the hills finally met the sea. 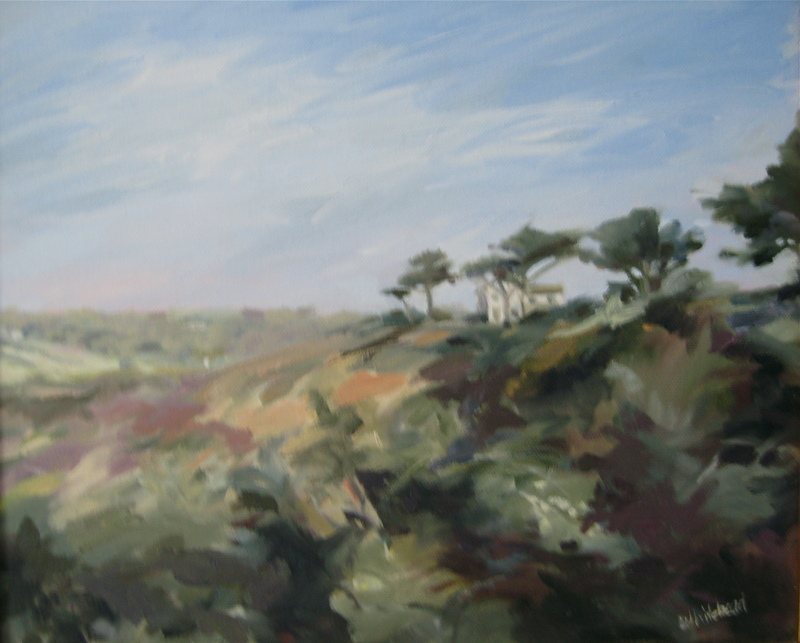 From the tall bluffs you could look across the hydrangeas and see the rolling hills. 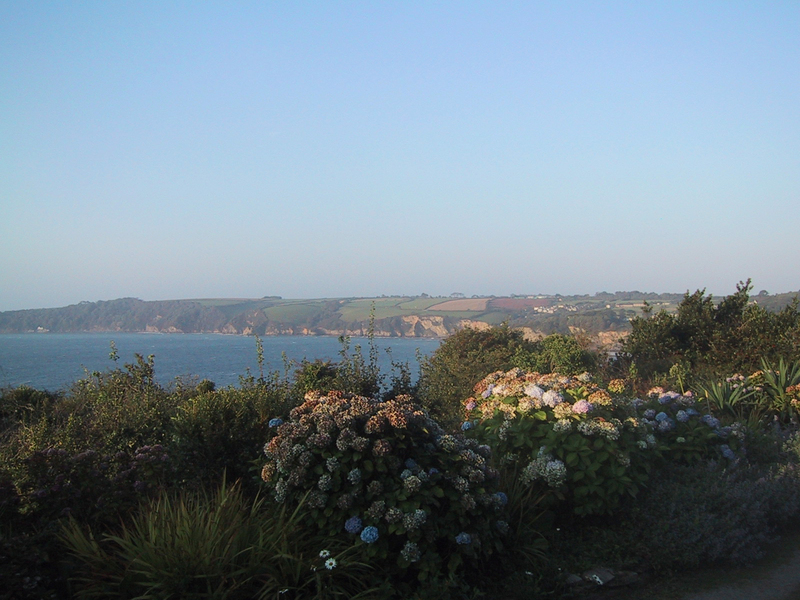 The cliffs were dotted with small inns and hotels, and we found a charming one called Porth Avallen Country House Hotel overlooking St. Austell Bay. Perched on the sea road, it was friendly and relaxed. The labyrinth of hallways and staircases only added to the old fashioned charm, and we were perfectly happy. Even more perfect, as soon as you walked outside, you could see the most amazing views. The colors were beautiful and no matter which way you walked along the seaside road, the views were a painting waiting to happen. But finally I saw the one that really held my interest. It was lovely. That lone house on the edge of all those gorgeous hills. There was something so isolated about it and yet, it was totally connected with its surroundings. You could just imagine curling up in one of it’s windowseats with a good book and a quilt. I painted it hoping to capture that feeling, and now I love that painting. It means domestic bliss in a wild world. all photos and painting by me. In my life, I can’t remember a time when I didn’t have a “studio”. 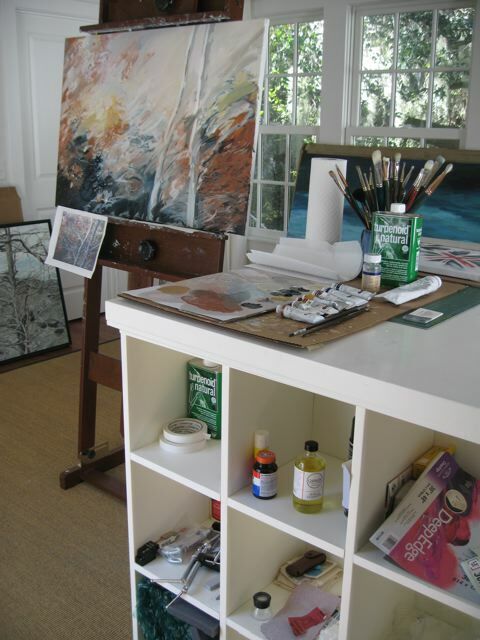 It may have been a box of art supplies that moved around a tiny dorm room or apartment – wherever I could find a corner to work – but it was still a studio nonetheless. Doesn’t really matter where it was, as long as I could paint. 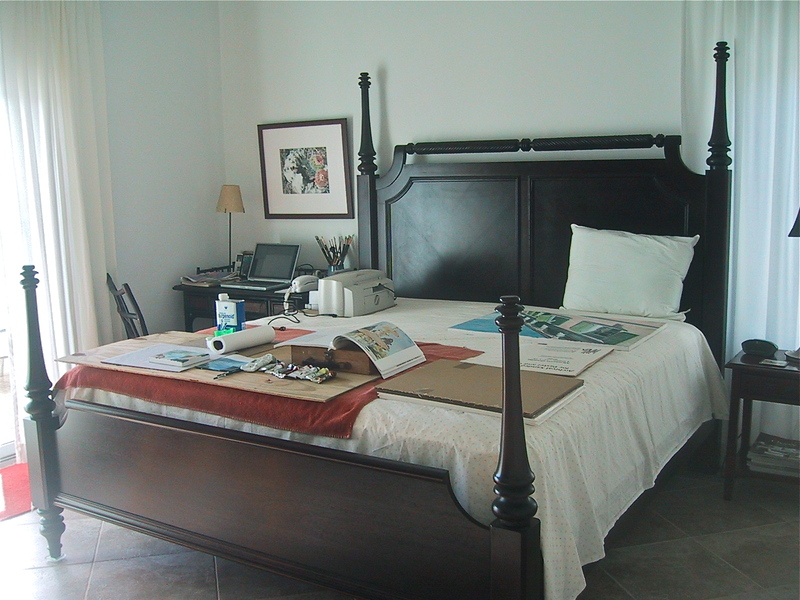 Notice that the furniture is covered with sheets in the photo below. I wasn’t always very neat. But I also often had a vase of flowers nearby. Just for the mood. …sometimes, even in the snow. 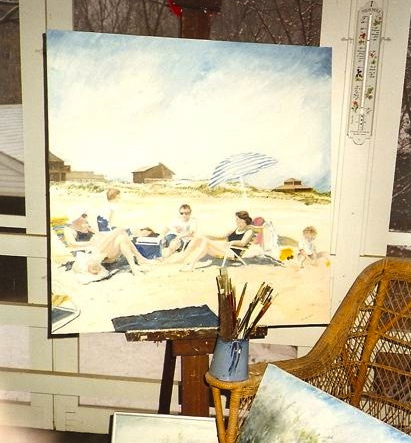 There is something about working on a summer beach scene with snow on the ground outside. 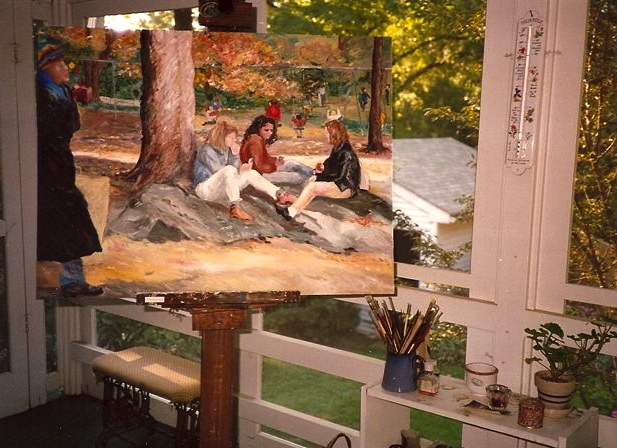 Art can transport you anywhere, and any season. 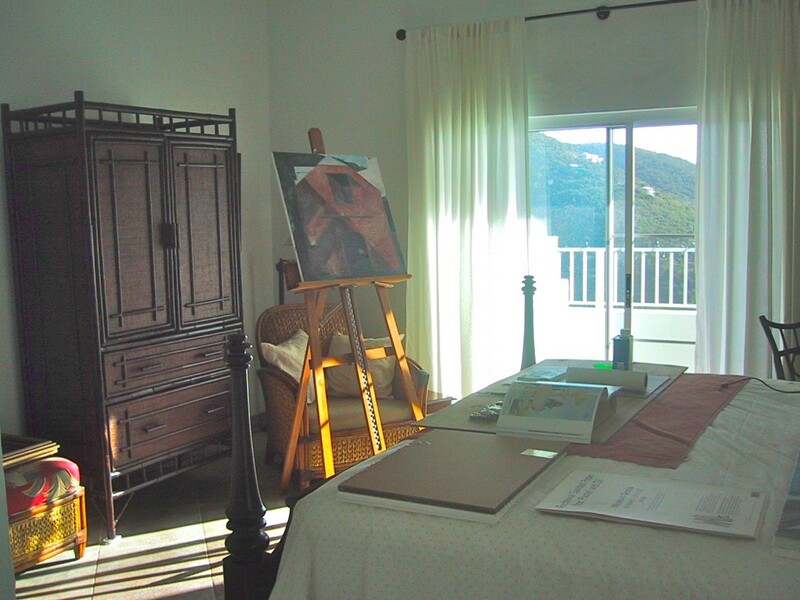 This was another one of my favorite painting spots…a third floor room that was away from everything. 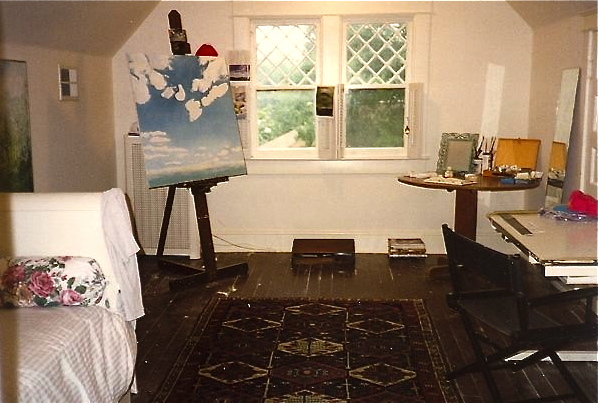 It was a converted attic that was perfect for painting. I loved looking down on the world from this space, the true artist’s garret. Now if it had only been in Paris. 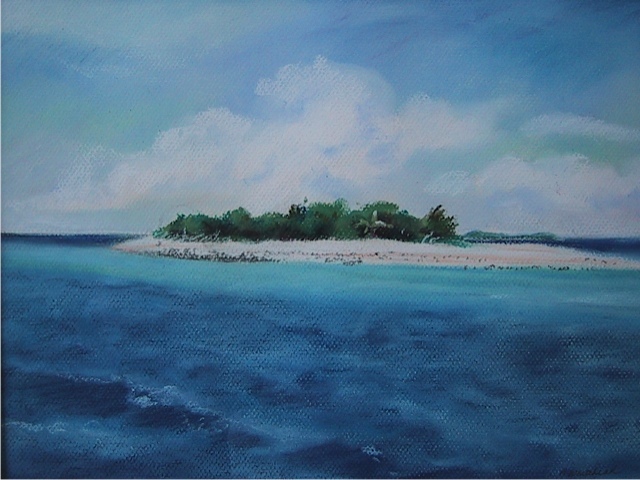 When we moved to the caribbean, it was often hard to find space, but I managed. If I didn’t use a corner of the dining room area, I would take over the guest bedroom. 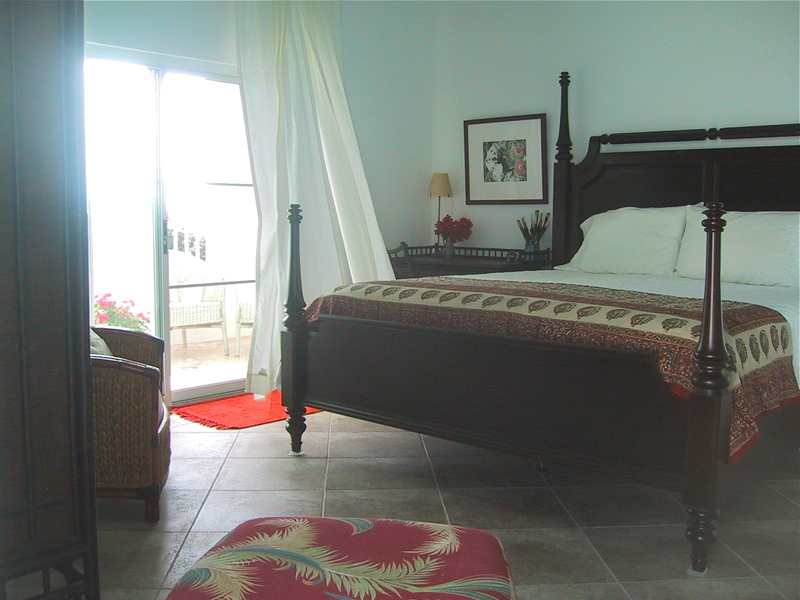 Ready for visitors...a guest bedroom in the caribbean. 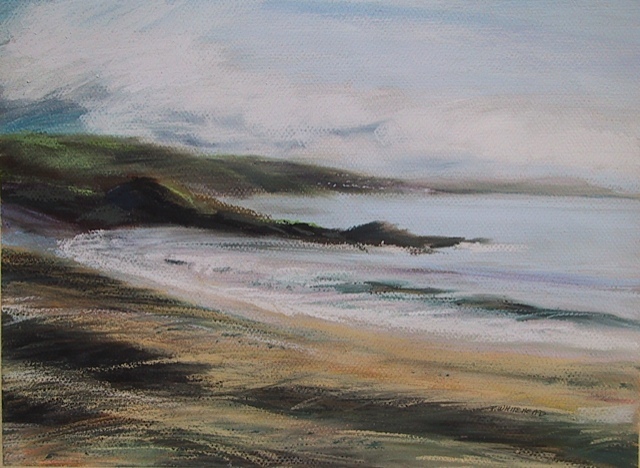 It converted quite easily, and the sea breezes were great when they weren’t blowing my canvas over. The only problem was moving everything when guests would arrive. But that was an easy solution. A small price to pay for having great space. Finally back in the states, I had a room all my own, and the work started in earnest. 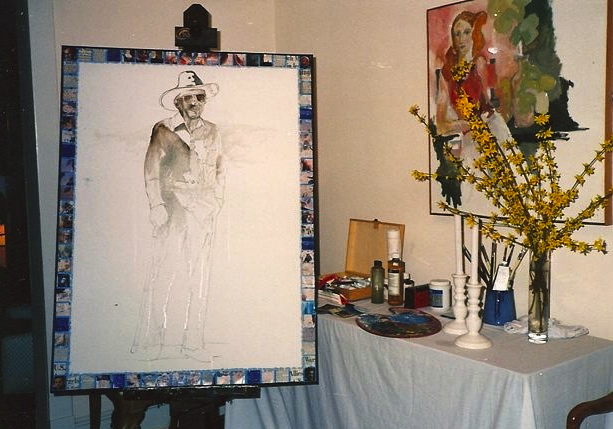 I was now a full time painter and the space reflected that. Age has its advantages. I loved being able to put things that sparked my creativity everywhere in the room. What a luxury. This was very special space, and it looked out over a perfect garden. 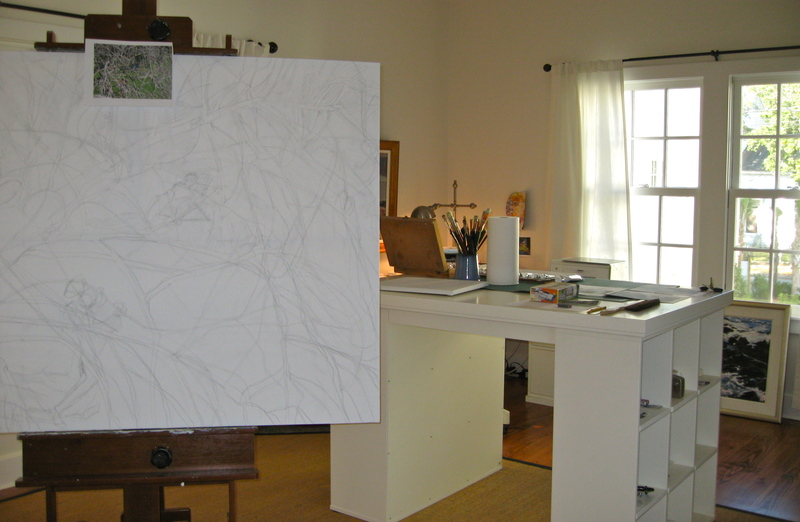 My current studio is the the best ever, although I tend to say that about each new space. But this one is very special. 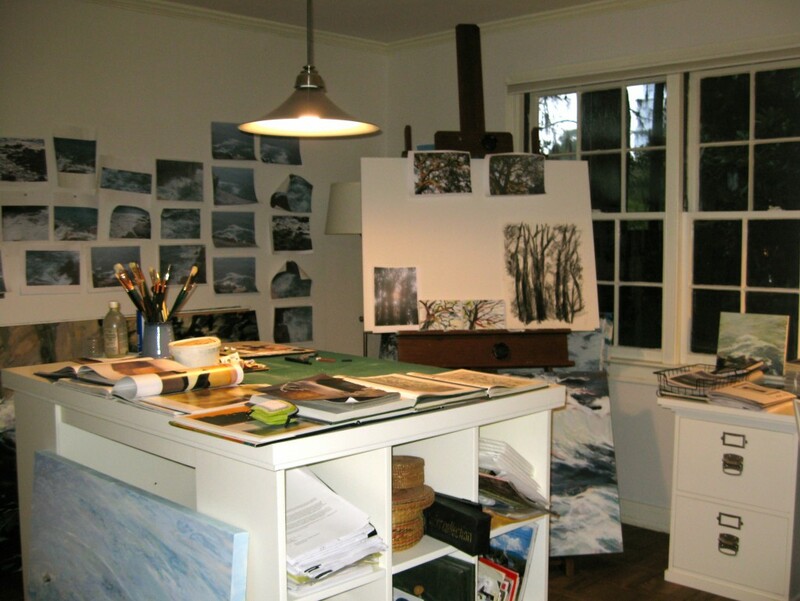 It was even designed as an art studio, and the north light floods the room. I spend most of my days in this creative space without any regret. It really doesn’t matter where I work. Once I start painting, I get lost in the creation process anyway, and most of the time I am totally unaware of my surroundings. I call it going in to the zone, and from what I gather most artist’s experience it. There is a moment when you lose yourself totally in the work and the world disappears. 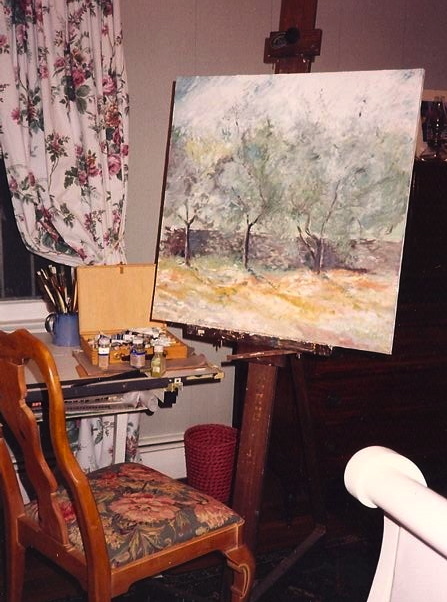 But this studio is sure nice to return to when I put the brush down. It is a grey (or the American version– gray) December day, and this is often when our thoughts return to those warm days we spent on the British Virgin Islands. Several of My Beloved Brit’s English mates have been chatting with him this week (on Skype, of course) about heading to warm places for a few weeks to beat the winter chill of England. 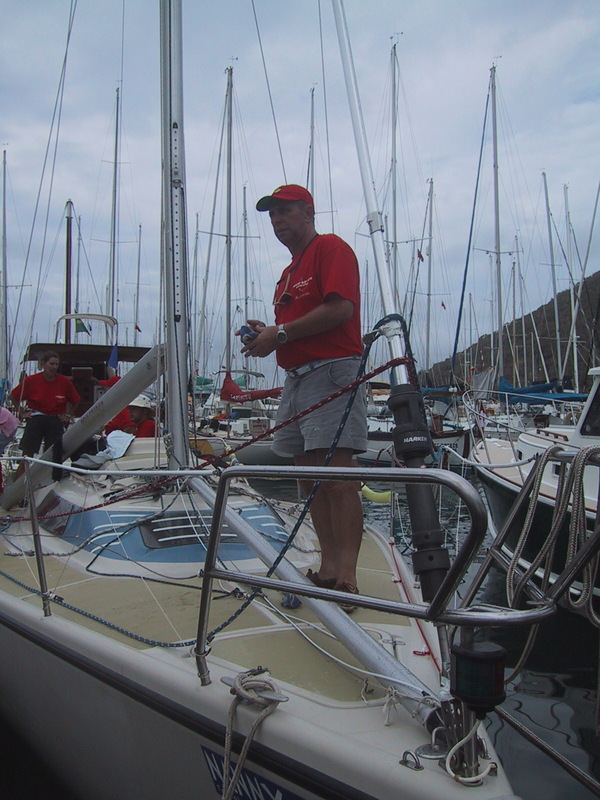 I know it brings back memories for him of his years on Tortola, and sailing into the sunsets…or getting ready to race across the seas. The shores of England have a totally different feel, I know. But they have always had their own special appeal to me. I often think I would like to spend some real time in England getting to know that country on an intimate basis. 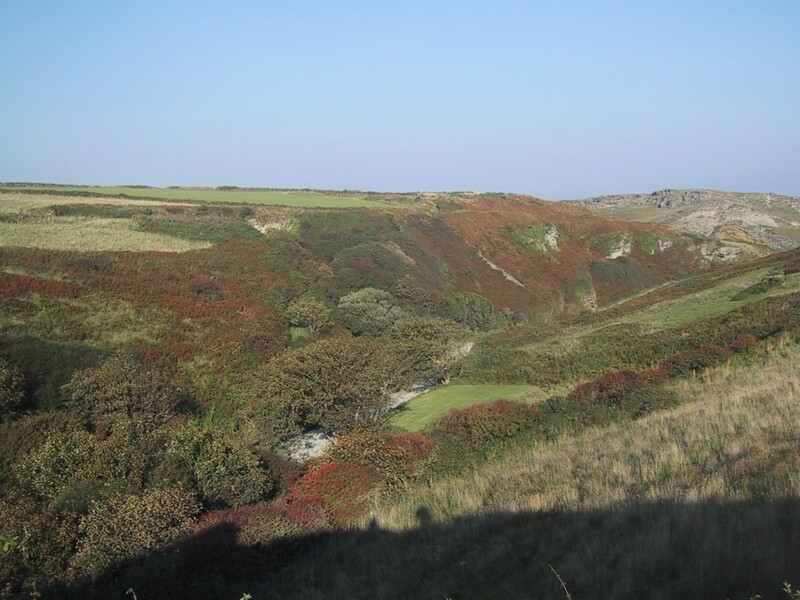 My Beloved Brit, on the other hand, grew up there, and although he misses it terribly (especially his family and his mates) he fondly calls it the “grey country” and hesitates to think of moving back to those cold wet days and early dark nights of a very long winter season. It amuses me sometimes how much climate dictates our decisions about where we move. Of course being the gypsies that we are, there is always another shore to explore, but MBB prefers it to be a warm one. England? Chances are slim for a more permanent move to those misty shores, but at least we get a chance to visit during the lovely summer months.